Integral Floating Discharge Line for Rotomites & FLUMPs. SRS Crisafulli. Note Floating Discharge Line extending a considerable distance from stern of dredge across the lake. 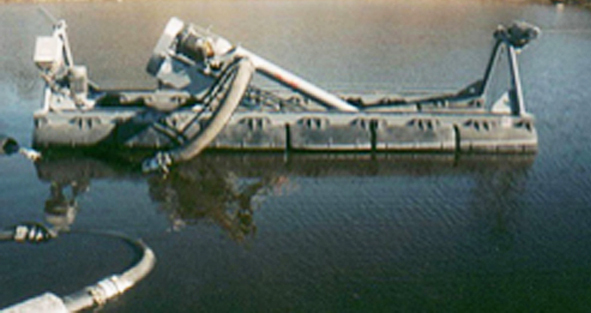 To carry the dredged sludge from the FLUMP or Rotomite to the designated disposal site, typically on land, the FLUMP uses a Crisafulli Integral Floating Discharge Line. The Discharge Line is modular, offered in either 15 foot or 20 foot rigid lengths, and 5 foot flexible lengths, and is one of three styles: (1) aluminum pipe with aluminum floats; (2) aluminum pipe with foam floats; and (3) polyethylene pipe with foam floats. Crisafulli recommends starting at the FLUMP with a flexible section, then alternating rigid and flexible, and ending in a flexible section. Each section, either rigid or flexible, includes a female quick coupler, a ring clamp and rubber gasket. A #150 flange is available to adapt to a customer’s pipeline. The Discharge Line is offered in 4-inch, 6-inch, and 8-inch,. 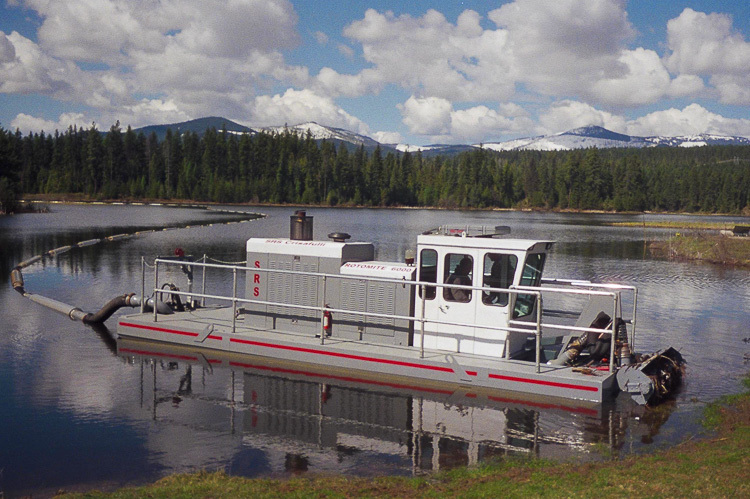 The Crisafulli Floating Discharge Line system is highly versatile, easy to set up and use, and can carry heavy, concentrated sludge across a pond to the discharge site, distances often up to 500 feet or substantially farther. Note discharge hose coming off the pump, just below the primary motor. Aluminum/Foam is light in weight and easy to handle. Aluminum/foam can be moved from site to site. The foam is not subject to puncture failure. Aluminum floatline is most appropriate for non-abrasive sludges and slurries. Polyethylene piping is most resistant to abrasives and can also be used to handle many corrosive slurries. Polyethylene piping is impervious to many substances which would damage aluminum or flexible rubber lines. Polyethylene piping is the most durable of the 3 styles. Poly pipe, however, is considerably heavier and requires two men to assemble. Aluminum/aluminum integral floating discharge line behind a Crisafulli self-propelled Rotomite 142 dredge. Aluminum weighs less than the other two types making each section easier to pick up and handle (especially if one man is setting up the float line). Choose aluminum/aluminum as the economical alternative when you install floatline at one lagoon and leave it there. Aluminum/aluminum can be punctured, however, and water infiltration can sink the line. If the floatline will be moved repeatedly from lagoon-to-lagoon, increasing the likelihood of a puncture, Crisafulli recommends an aluminum/foam or poly/foam floating discharge line. All Crisafulli integral floating discharge line comes in manageable, convenient lengths for ease of handling and assembly.